Reference number for this case: Beg-Oct-54-Villeneuve-sur-Lot. Thank you for including this reference number in any correspondence with me regarding this case. A regional newspaper for October 18, 1954 is said to have reported that in Villeneuve-sur-Lot, Mr. Molenaer, building painter, was fishing by day on the banks of the river Lot, when he saw various luminous phenomena at a hundred meters. He then saw an apparatus shaped like a saucer land gently and without noise on the river Lot. A small being came out and filled a bottle from there with water of the river. After a few seconds, the being went inside his apparatus which flew away at "a tremendous speed." A duet of French skeptical ufologists said in the 70's that it was a hoax, without providing further information. The two ufologists and authors indicate that in October 1954, in Villeneuve-sur-Lot, Mr. Moleaner, building painter, was fishing by day on the banks of the river Lot, when he saw various luminous phenomena at a hundred meters. A small being came out and filled a bottle from there with water of the river. At the end of a few seconds the being went inside his apparatus which flew away at a tremendous speed. The authors indicate that the source is an article in the newspaper La Dépêche for October 18, 1954. The authors indicate that in Villeneuve-on-Batch in 1954, the single goal of the extraterrestrial visitors was to draw a sample of water from the river with a bottle. They indicate that the newspaper La Dépêche specified at the end of the story: "Was Mr. Moleaner, whose good faith cannot not be doubted, the victim of an hallucination?" They declare that they can answer that it was neither am hallucination nor extraterrestrial visitors but only a good joke which put the witness in the highlights during a few days in the village. Jean Sider indicates that at the beginning of October 1954, during daytime, in Villeneuve-sur-Lot, the Lot-et-Garonne, Mr. Moléaner was fishing on a bank of the Lot, when he suddenly noticed about a hundred meters from him various light phenomena, followed by a machine in the form of a saucer that gently and silently landed on the river. A small being appeared and filled a bottle of water. After a few seconds of parking, the craft took off as soon as its occupant re-entered it, and disappeared at a tremendous speed. The Belgian ufologist indicates in her chronology that in October 1954 in France in Villeneuve sur Lot, Mr. Moleaner was fishing on banks of the Lot and saw at a hundred meters various luminous phenomena, then a machine in the shape of a saucer which gently landed without noise on the Lot. A small being came out and filled a bottle with water from the river, at the end of a few seconds it reinstated its apparatus which took off at a fantastic speed. The author indicates that the source is M. Figuet et J.L. Ruchon, "Ovni, premier dossier complet...", Alain Lefeuvre, 1979, pages 99, 100. A metallic saucer shaped object was seen landing silently near a river. A small humanoid emerged from the object and filled a bottle with water from the river. He quickly leaves. Luc Chastan indicates that in the Lot et Garonne in Villeneuve, in October 1954 at an unknown hour, "the witness fishes on the banks of the Lot. He sees at a hundred meters various luminous phenomena, then an apparatus in the shape of saucer that lands gently and without noise on the Lot. A small being comes out and fills a bottle with water from the river. At the end of a few seconds the being resinstates its apparatus which flies away at fantastic speed." The source is given as "Ovni, Premier dossier complet... by Figuet M./ Ruchon J.L. ** Alain Lefeuvre pub. 1979." The website indicates that in October 1954 at 12:00 in Villeneuve-sur-Lot, France, "Disc lands silently. Humanoid exits and fills bottle with river water." And: "Close encounter with a an unidentified craft and its occupants. One disc was observed on a river. One dwarf was seen." The source is given as "Hatch, Larry, *U* computer database, Author, Redwood City, 2002." 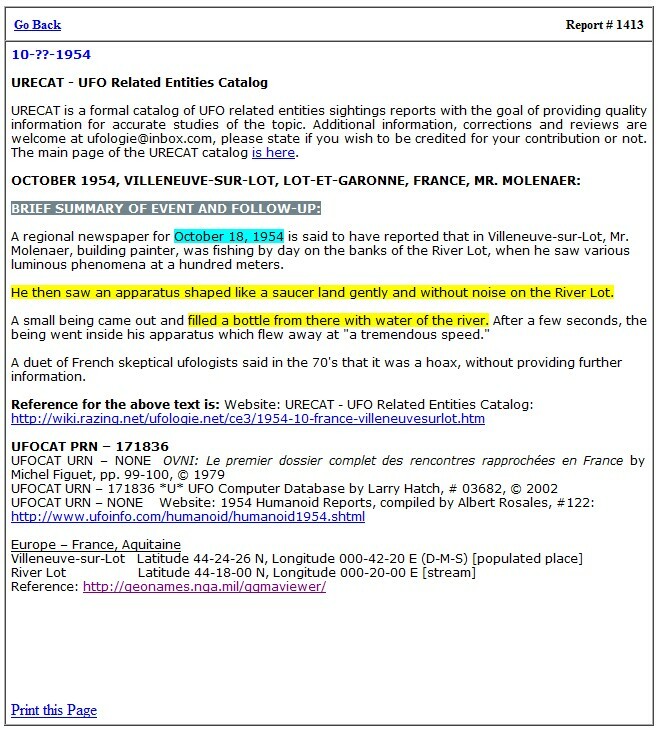 The author indicates that there was a close encounter of the third type in Villeneuve-sur-Lot, the Lot-et-Garonne, in early October 1954, by day at an unspecified hour. Mr. Moleaner, a house painter, fished on the banks of the Lot, and saw a few hundred meters various luminous phenomena, and then a machine in the form of a "saucer" which landed gently and silently on the Lot. A strange little being came out of it and filled a bottle of river water, and after a few seconds, he re-entered his craft which flew off at a fantastic speed. Sources are indicated as La Dépêche du Midi for October 18, 1954; Michel Figuet and Jean¬Louis Ruchon in "OVNI: le premier dossier des rencontres rapprochées en France", pages 99-100; Jean Sider, "Le dossier 1954 et l'imposture rationaliste, page 175. URECAT is a formal catalog of UFO related entities sightings reports with the goal of providing quality information for accurate studies of the topic. Additional information, corrections and reviews are welcome at ufologie@inbox.com, please state if you wish to be credited for your contribution or not. The main page of the URECAT catalog is here. The true name of this witness is probably not Moleaner but Molenaer. Moleaner is a non-existent name, Molenaer is a known name in this area - just as Molinier and Moulinier. Barthel and Brucker state, like often without giving the least useful information or confirmation, that it was a hoax. It is quite likely, if only when the very meager description of the event is considered, or because of this use of a bottle. However, I do not have any trust in their assertion. On one hand, they reproduced the very probable misspell of the witness name, on the other hand, they are unable to give the least date for the alleged sighting, they quote only one line of an newspaper article without even caring to give its date and so on. This is very bad ufology, hardly better than the copying of summaries of the affair with no more research by other ufologists. [fr1] "OVNI - Le Premier Dossier Complet Des Rencontres Rapprochées En France", book by Michel Figuet and Jean-Louis Ruchon, Alain Lefeuvre publisher, France, pp 99-100, 1979. [bb1] "La Grande Peur Martienne", book by Gérard Barthel et Jacques Brucker, Nouvelles Editions Rationalistes publishers, France, page 82, 1979. [mf1] Francat, catalogue by Michel Figuet, France. [jg1] "RR3 - Le Dossier des Rencontres du Troisième Type en France", book by Julien Gonzalez, Le Temps Présent publishers, France, page 97, 2014. 0.1 Patrick Gross January 11, 2005 First published. 1.2 Patrick Gross December 21, 2016 Additions [jg1], [wu1], Summary.